This Tote bag is eye-catching in any situation. A super chic exterior hides the hyper-organized KNOMO interior. 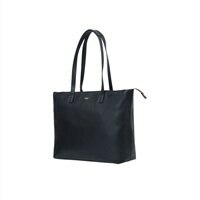 Knomo Maddox - Notebook carrying case - 15" - blackThis Tote bag is eye-catching in any situation. A super chic exterior hides the hyper-organized KNOMO interior. Fits up to 15-inch laptop. Designated section means your laptop is easy to grab on the go and kept separate from your other possessions. Cleverly concealed pocket at the top of the bag, perfect for your phone, keys and other smaller items you need to get at regularly, now accessible without having to open up the bag. Essential for storing your phone, bank cards, and passport to ensure you're not prone to identity theft.